Crete, the largest Greek island, is a great place for holidays as it offers an endless variety of things to do and see whether you are looking for stunning beaches, great food, hiking, partying, ancient culture and archaeology, or just to chill out. So you can imagine how happy I was to have been invited by Aldemar Royal Mare Spa and Thalasso 5* Luxury Resort in Crete to live the experience and write about it! Built in 1996, Aldemar Royal Mare is a small Mediterranean village and the company’s flagship resort. It is st by the sea in the popular area of Chersonissos in Crete and is easily accessible from the airport of Heraklion in only 30 minutes by car or taxi. Now, I have to admit that I am not a resort holiday kinda person. I like exploring, eating great food and coming into contact with the locals. So I was slightly sceptical about spending a whole week -well-“locked up”. That feeling, however, immediately disappeared after spending my first day in Royal Mare. 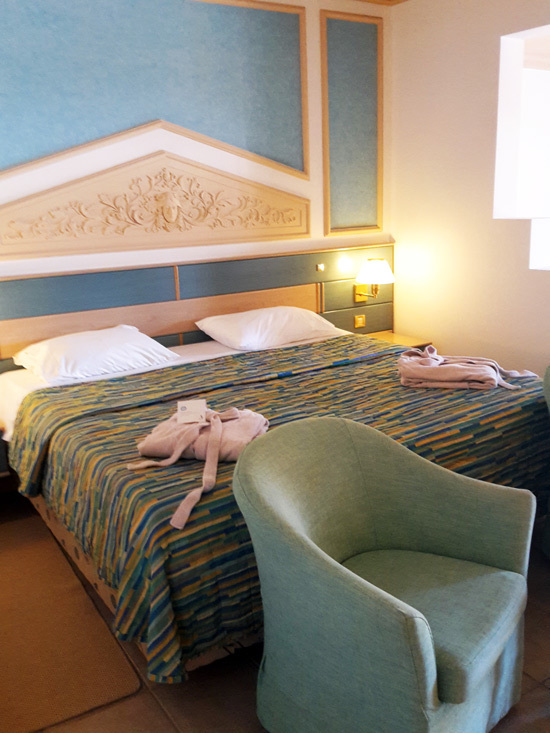 First of all our room was fantastic: it was very large (49 sq. meters) with a living room and two sofa beds. We had one of the Junior Suites in the ATHENA complex (room 912). 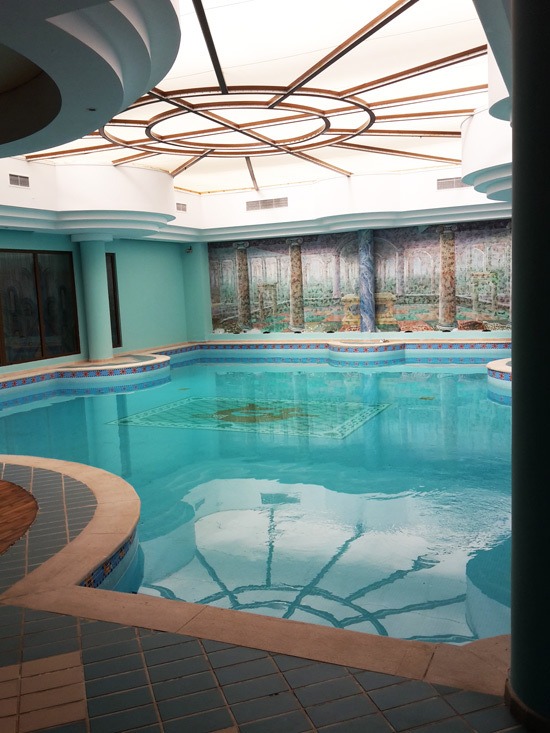 This came with a “private” pool shared with only a handful of neighbouring rooms and it was mostly empty! All pools in Aldemar have sea water and are perfectly clean, so I was not anxious at all about my 6 year old daughter spending a whole week splashing about non-stop. Also, the whole resort is in top shape and everyday we saw people doing some kind of improvement or gardening so that the place will look and function at its best. 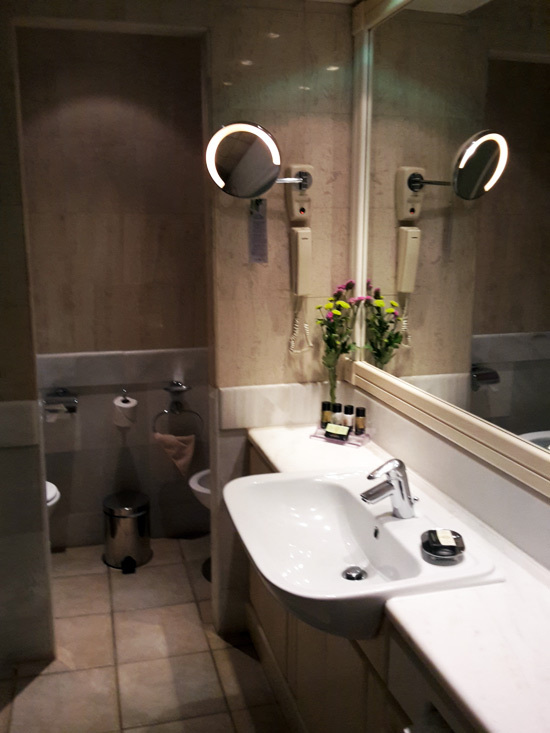 Our bathroom had a shower, a jacuzzi and free toiletries. Rooms are cleaned twice a day, one thoroughly in the morning and then a second time in the afternoon trash and dirty dishes are collected. Mattresses are by COCOMAT; this and great anti snoring pillow set provided the ultimate comfort for the whole time of our stay. The air-con worked wonderfully and Internet was fast and free, although I think that for basic rooms you need to pay extra if you are going to require a lot of MB usage. 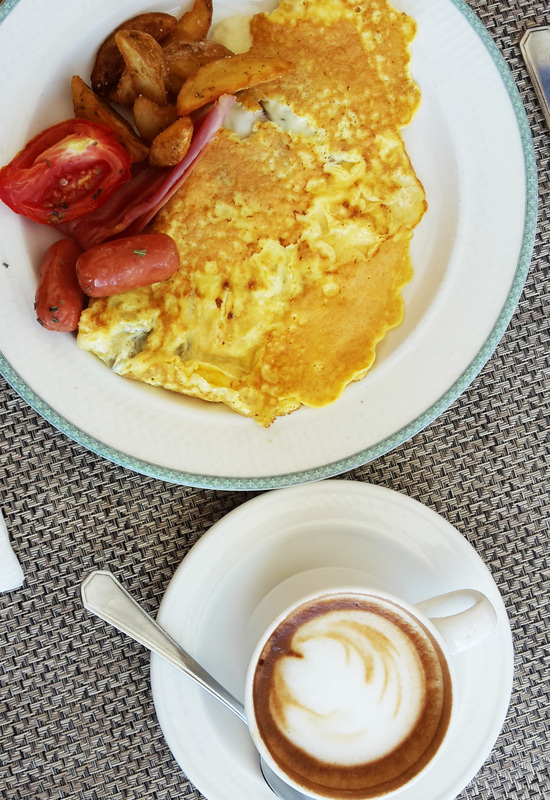 For breakfast (which thank god was until 11 am) we were in the VIP El Greco restaurant where Ms. Olga makes the best omelets ever: you choose the ingredients and after a short while she produces her magic. There was also nice bread, local honey, yogurt and high-end charcuterie (think prosciutto and good quality hams), local and international cheeses plus a TON of fresh fruit. Aldemar seems obsessed with fruit and I ended up eating much more than I usually do, as it is always fresh and in season. Plus we had a” fruit boy” come every day in our suite and we could choose our fruit to snack on mid-day at least until the next meal! leg of beef or lamb, gyros souvlaki etc.) carved by one of the cooks, plus a substantial dessert buffet with a good selection of fruit, desserts and ice cream. anything” Vassilis Daskalakis told me, “plus food is much tastier if you use hame made stock”. I couldn’t agree more. 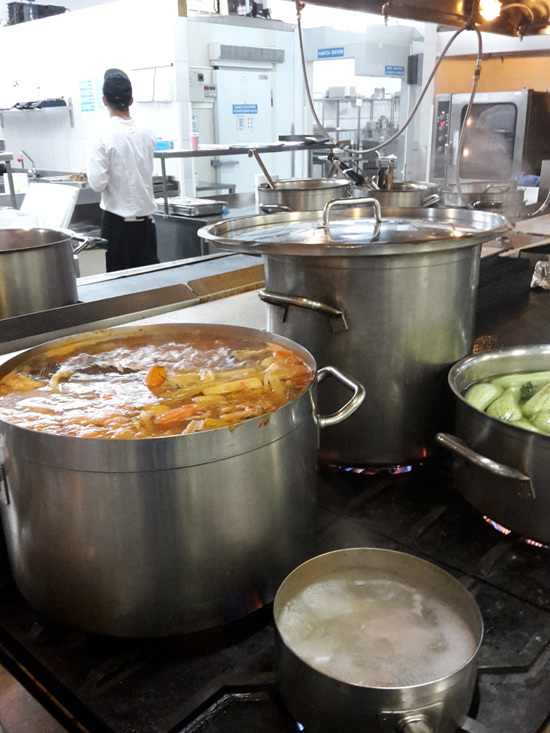 I was also curious about what happens to leftovers and he explained that the dishes that are safe to consume after having spent some time on the buffet are divided among workers in Aldemar, so waste is almost minimal. Making stock and fish soup from scratch! If you get tired of the food in your package you can always visit one of the two a la carte restaurants, Candia serving mediterranean cuisine and Royal Palm serving sushi and oriental food, or join one of the theme evenings like BBQ night, Lobster night or Fish night that take place in El Greco. 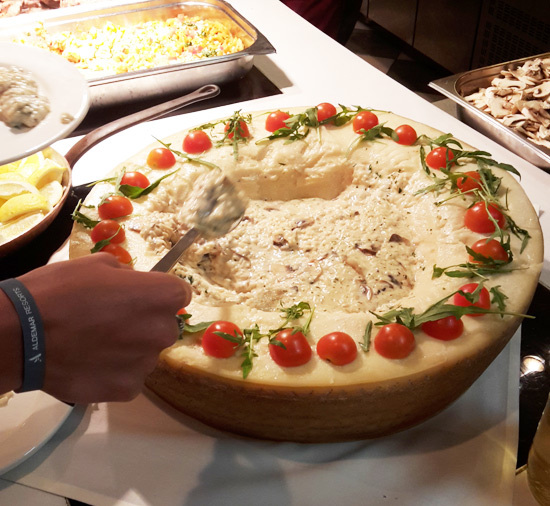 Finally, something that few people outside the industry know, Aldemar organizes a cooking tour every year, called Sympossio Greek Gourmet Touring. 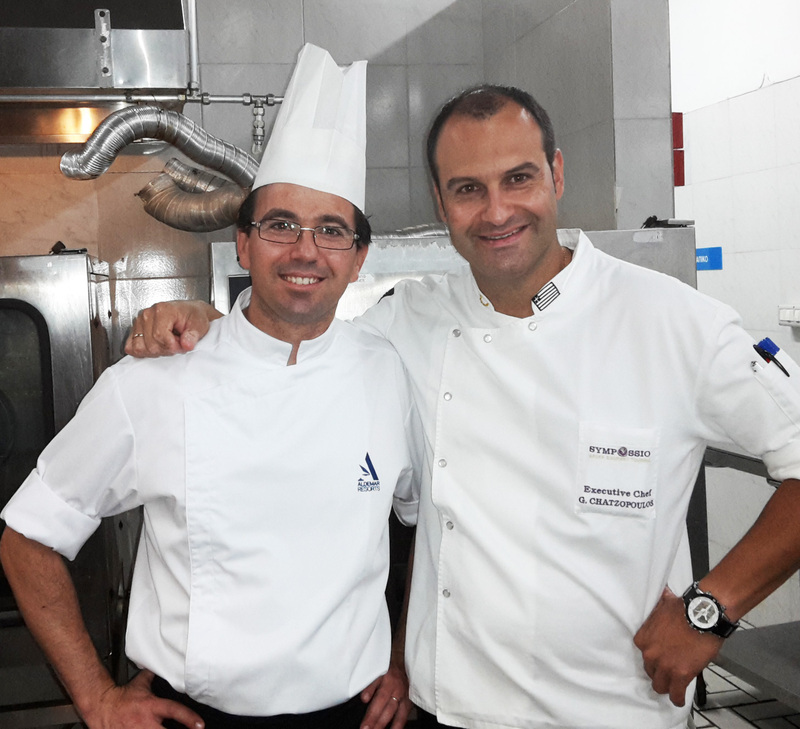 A team consisting of the executive chefs that work in Aldemar resorts tour European cities and presenting Greek gastronomy and food through cooking lessons to people of the tourism industry. 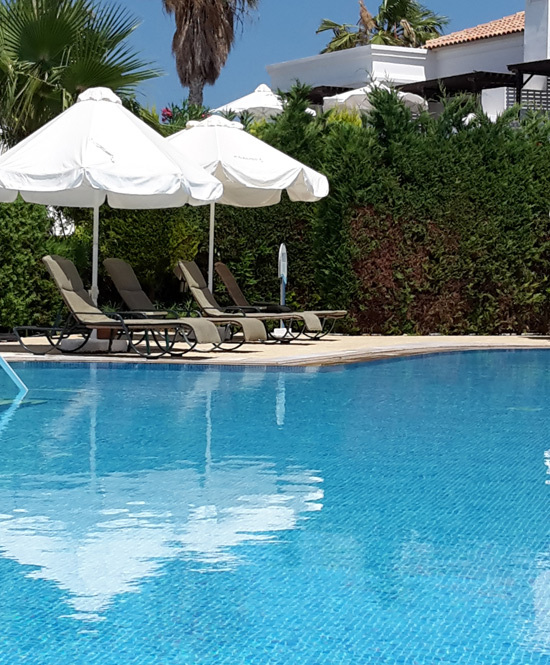 You must be wondering by now what else there is to do in Royal Mare apart from swimming, relaxing and eating. Well loads! First of all there is a good animation team (by Pink Wave) that runs daily athletic activities, quiz nights and the kids club. I would go to the pool every day at 11.30 for aqua gym or zumba and it was so much fun (thank you Barbora, Laura and Claudia)! For those not keen on water sports at 10.15 and 15.30 everyday there was either pilates, yoga, abs and legs exercises, zumba and more. There are also good clay tennis courts (and lessons offered) and a mini golf. 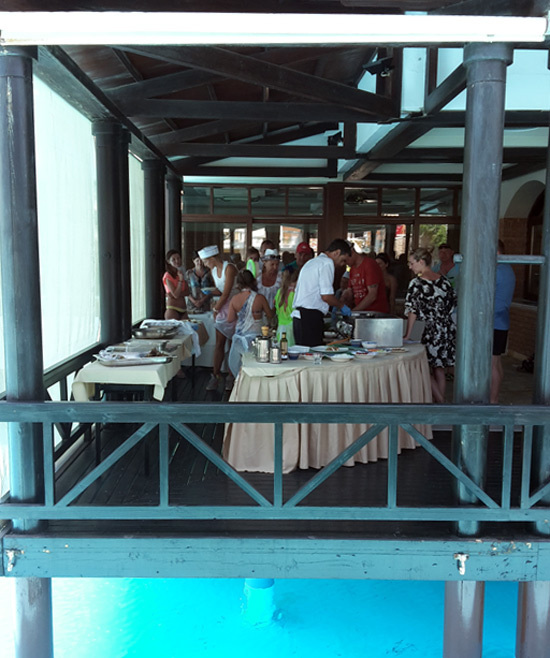 On Saturdays there is always a cooking lesson by one of the chefs. During my stay George Vidalis, trainee chef at Candia a la carte restaurant, cooked for us two modern Greek recipes that we were afterwards lucky enough to eat! 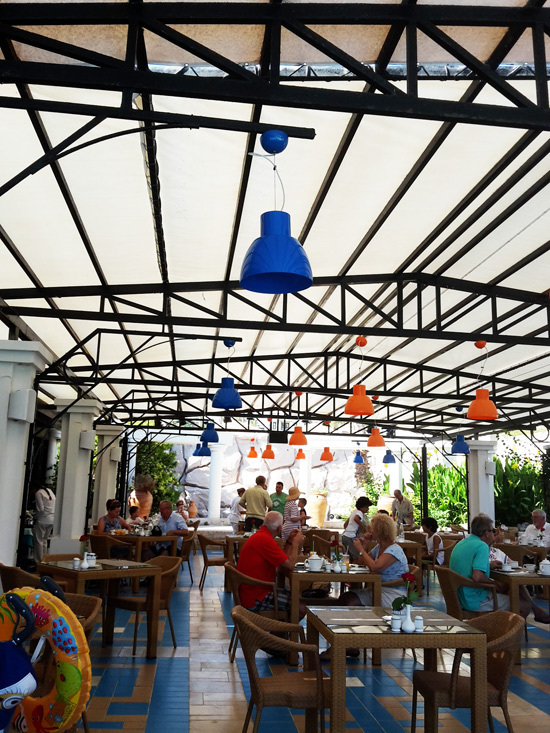 If you still find entertainment is limited you can always join the activities that take place in the adjacent Aldemar resort, Knossos Royal, at a 5′ walking distance from Royal Mare. Just ask at the reception! I also found the Minos Bar a nice place to end the day, with beautiful views over the resort and the sea and excellent cocktails at normal prices (8 euro per cocktail unless you have an all-inclusive deal). A few days per week there is live music and the quiz night was fun: we even won!! Finally, if you like spas and therapies the Thalasso Spa has been voted the best in Europe for 2015 and offers a wide variety of treatments. Although Royal Mare is not the designated family hotel of the Alemar Resorts, it is a good place for kids. 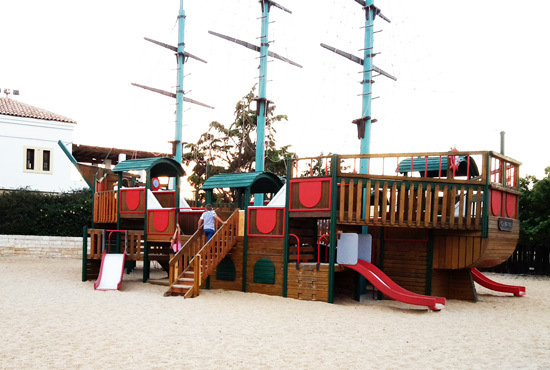 Apart from the two main swimming pools, there is a large playground with an impressive pirate ship, swings and a small pool which thankfully had a sunshade. A small building occupies the area where the Aldy kids-club takes place every day and the mini disco from 20.00-20.30. The people running the kids club were lovely and my daughter had so much fun at the mini-disco every night. Unfortunately, however, she didn’t want to participate in the daily activities, as all the staff was english-speaking and her english is not that great. There also weren’t many kids her age and she found swimming in our private pool better fun. What we, as parents, loved about Aldemar, is the fact that it was safe enough for her to move around the resort (i.e. from breakfast to our room and back), there was a lot of healthy food available, and staff were obliging. Plus taking the cart to and from the main building was also great fun for all of us! Last but not least I need to talk about the staff of Royal Mare resort and spa and how big a difference they made to our stay there. I would like to thank all of them for their commitment and friendliness. 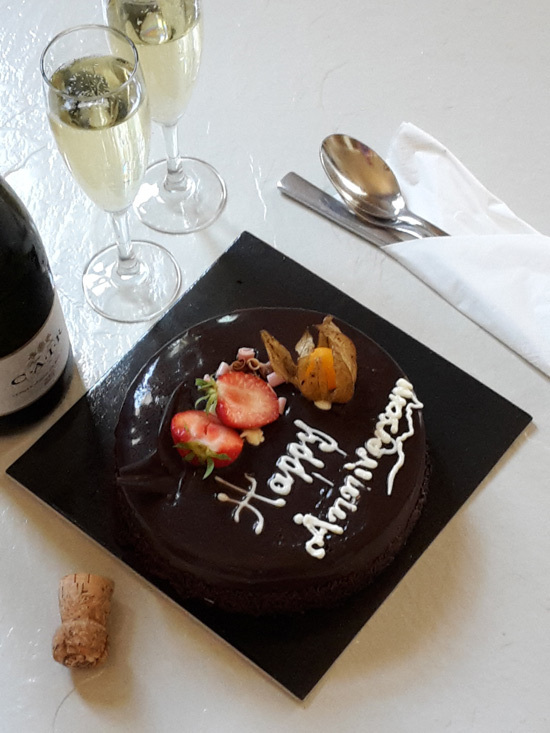 We felt welcome and taken care of in every respect and we even got a cake and sparkling wine for our 10 year wedding anniversary!!. This is why people return to Royal Mare. I met two couples in their 50’s and 60’s that have been visiting the resort for 10 years and they usually stay two to three weeks! They feel that Royal Mare is their second home and I saw how they greeted the staff: like family. I hope we manage to return to this beautiful place and re-live the luxurious and relaxing experience that Royal Mare resort is about.